Howdy all! We are inviting you all to Grand Island, NE to come to shoot our SASS Nebraska State Blackpowder Shootout, sponsored by Hornady and Hodgdon’s, and the Heartland Public Shooting Park. It is hosted by the Platte Valley Gunslingers. It is a 10 stage match, with lots of fun sidematches, a night stage, and great food and people. 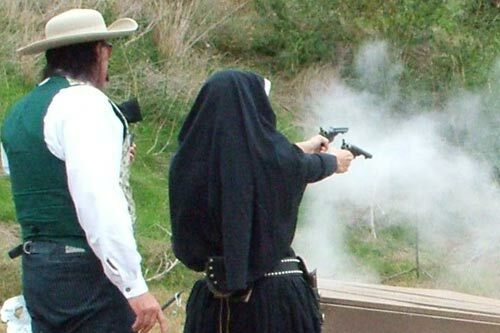 We have smokeless classes as well as black powder. All standard classes are available as Frontier Cartridge, ie. FC Wrangler, FC Cowboy, etc. Plainsman is also welcome as its own class. The night stage is shot using lanterns, and torches, and at the gallows. No spotlights are used to illuminate our targets, which make the shooting that much more spectacular. Cost is $65 for 1st shooter, and $55 for spouse. RV and dry camping is available on site. Reservations do need to be made by calling the Shooting Park. Outstanding BP State Shootout! Great people and superb range!